Giving your kitten the best start in life all begins with the right nutrition. Providing it with the essential nutrients it needs will properly support your kitten’s development and growth at critical stages and beyond. Royal Canin’s delicious recipes instinctively preferred, along with great taste is a complex blend of minerals and proteins which is hugely beneficial for a young digestive system. Feeding your kitten a palatable diet that takes taste, scent and texture into account will lead to long-term, instinctive acceptance of the nutritious food that you provide. During the second growth stage (4-12 months), your kitten’s immune system will not be fully developed yet. Royal Canin Kitten Instinctive helps strengthen the natural body defences of your kitten with a complex of antioxidants such as vitamin E, vitamin C, taurine and lutein. This means that providing your kitten with food that it likes as well as the food that it needs is vital for normal eating routines and essential nutrition intake. 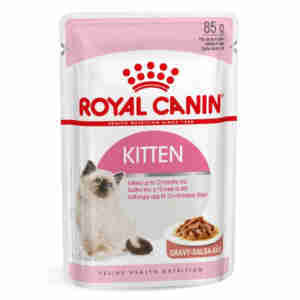 Royal Canin Kitten Instinctive in Gravy provides all the essential nutrients needed to sustain high energy requirements and support bone strengthening as well as good overall health maintenance. During the second growth stage (4-12 months), your kitten’s immune system will not be fully developed yet. The special combination of complex of antioxidants such as vitamin E, vitamin C, taurine and lutein will support your kitten’s natural body defences. Roya Canin's Intense Beauty is the best food for my long haired cat, virtually no waste and a healthy looking cat. Reliability and delivery impeccable! Having tried many different brands of cat foods, wet & dry, over the years with different cats I am completely committed to Royal Canin. I feed my cats a token amount of Instinctive wet food twice daily with a bowl of Fit 32 dry food always available. Firstly, my 2 cats love it - good reason number one. Secondly, my cats remain healthy with beautiful shiny coats and never bring up fur balls. Thirdly, when compared with high street brands it really is no more expensive in the long term.